Maybe we live on the "Red Planet." That’s what the sky looks like today with sustained winds above 50 miles per hour and wind gusts near 70 miles per hour. The highest reading so far was 68 miles per hour at about 1:15 according to the National Weather Service. The wind storm is causing power lines to be disconnected in some parts of Liberal along with damage to rooftops and fences throughout the area. 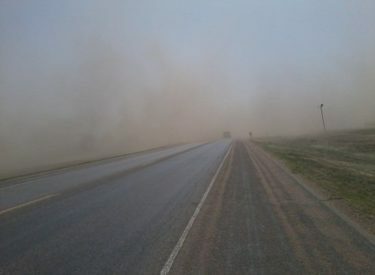 The High Wind Warning continues until 7 p.m. The wind is also the cause for overturned semis with injures near mile marker 20 on Highway 83 and west of Kismet on Highway 54.